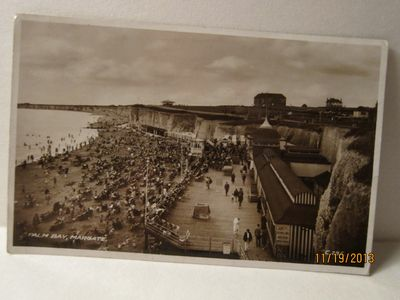 On the Front of the Card: "PALM BAY, MARGATE" and "C 285." On the Back of the Card (Top): "Valentines"
Dividing the Card (Center): "This is a real photograph"
Stamp Box: No border. "STAMP HERE 33-2"
Postmark: "MARGATE 22 JUN 1935"
Hand-Written Note: Mrs Garner / 92 Glover Rd. / Lyton E10 / "Dear Mrs. Garner, / I am pleased to say the weather is better to day. Lot of people here. Black Cat are coming here tomorrow. I like to watch there cappers. Love A M"
For more cards of this type, please see the full list of "Kent, England" Postcards in the "Where is This?" Section.